It took two months and one price cut for Rick Rosa’s client, a condo owner in New York’s Long Island City, to finally find a buyer for her one-bedroom unit. Then came news that Amazon.com Inc. is coming to the Queens neighborhood. The seller saw dollar signs. She refused to sign a contract with the would-be buyer, and pulled the listing to wait for a more lucrative future. 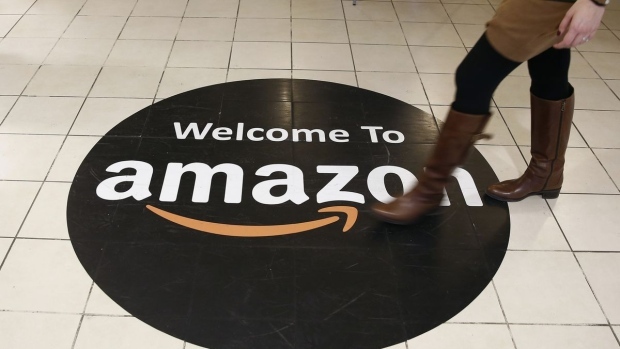 The online retailer on Tuesday announced plans to locate East Coast office hubs in Long Island City and the Crystal City area in Northern Virginia, eventually bringing 25,000 employees to each locale. Both communities have already drawn real estate speculators, long before a single worker arrives. 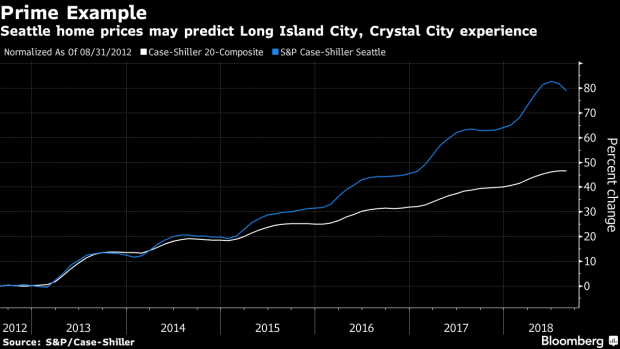 The Amazon effect would be familiar to anyone who’d lived in the company’s base in Seattle, where single-family home prices have gained almost 80 per cent in the past six years. This time, Amazon should aim to avoid the loss of affordable housing and surging homelessness that came with the explosion of growth in Washington State, said Margaret O’Mara, a professor at the University of Washington in Seattle, who has studied the history of Silicon Valley and other tech hubs. Both Queens and northern Virginia have already had strong real estate price growth as young families sought less-costly homes near public transportation, with easy access to Manhattan or Washington. Though Amazon has said it’s committed to preserving affordable housing, its arrival will unavoidably act like an “accelerant” on the property market, pushing poor people farther out, said Nina Janopaul, chief executive officer of the Arlington Partnership for Affordable Housing. Long Island City was largely an industrial district until early in this century, when a series of zoning changes sparked a residential boom. Just across the East River from Manhattan, it quickly drew young families and singles, and prices started rising. The neighborhood is already contending with the problems that a sudden influx of residents bring. Long Island City has the most parking complaints per resident in New York’s five boroughs, and also ranks No. 1 in complaints about blocked bike lanes, according to real estate website Localize.city. In Virginia’s Crystal City on Tuesday morning, just hours after Amazon announced it was coming, broker Sue Rasoul was awakened by a flurry of calls from home shoppers interested in a two-bedroom condo with balcony views of Washington, listed for US$505,000. She had to tell them it was in contract. It had spent months on the market with little interest. Online searches for homes in the two locales have skyrocketed. In the week ended Nov. 11, views of homes for sale in Long Island City jumped 1,049 per cent from a year earlier, according to national brokerage Redfin. Views of listings in Crystal City, which is much smaller and will only have a portion of Amazon’s offices in northern Virginia, were up 217 per cent year over year. In Long Island City, open house attendance doubled at two new projects marketed by Rosa and his partner Alexander Pereira. And agents at Modern Spaces, a brokerage based in the neighborhood, were so busy on Sunday that they summoned management for reinforcement. “I had to excuse myself from from my son’s birthday party, because agents were texting and calling me to say they were swamped,” said Eric Benaim, CEO of Modern Spaces, which markets the lion’s share of new development sales in Long Island City. In the coming months, he expects his developer clients to raise prices at their under-construction condo towers. And he’s also been fielding calls from brokers who work for other companies, in other boroughs, seeking employment. Benaim estimates he’s going to hire as many as 30 new agents within the next four months. “We won the real estate broker lotto,” said Benaim. Developers whose construction of luxury condo towers in Long Island City outpaced demand also won the lottery, courtesy of Amazon. Long Island City already has the largest number of apartments currently under construction in New York City, Localize said. It ranks No. 1 in newly authorized units, as well as for permits awaiting approval. More than 18,000 new apartments, including 3,420 for-sale units, have been completed since 2006, according to the Long Island City Partnership. The making of a possible apartment glut was exacerbated by a citywide slowdown in sales this year, which led to an 18 per cent decline in the median price of resales in Long Island City in the third quarter from the prior year, according to StreetEasy. The prospect of finding a bargain in the neighborhood may be over as the new arrivals fill the empty apartments. LCOR, the developer of Crystal City’s Altaire, two rental towers with penthouses that rent for more than US$12,000 a month, also just got lucky. The buildings along the Potomac River, with a total of 450 apartments, opened in September. Construction started long before Amazon’s plans were hatched, said Harmar Thompson, executive vice president of LCOR. About 40 per cent of the units, which start at US$1,700 a month for junior one-bedrooms, are now occupied. Thompson expects Amazon’s young workers to flock to the towers, in part, because it’s likely to be within walking distance of the headquarters. Even though LCOR is building luxury housing, Thompson says Northern Virginia should focus on residents who aren’t getting big Amazon pay packages.